Friday night is significant in many ways. This particular Stagg Bowl is the culmination of another great Division III football season, one in which a record 247 teams and likely more than 20,000 players took part in about 1,200 games over 16 weeks from Castine, Maine to Thousand Oaks, Calif. And the final two teams standing are familiar faces. D-III will have a new champion, as the current holder of the crown, UW-Whitewater, was deposed in the semifinals. 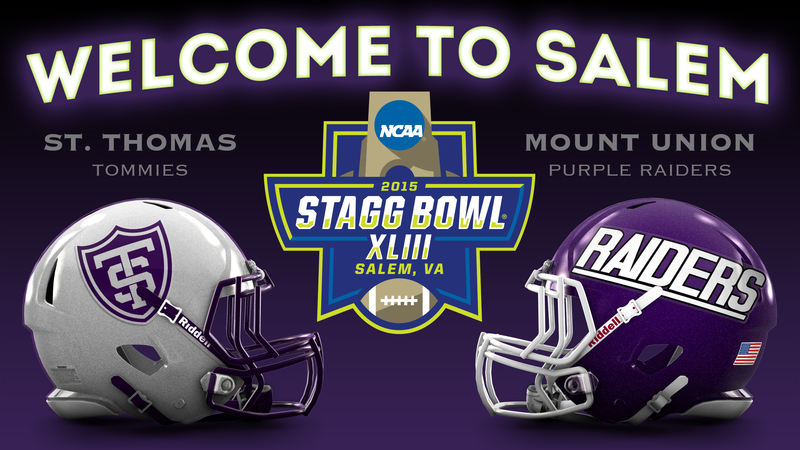 Mount Union, in its 19th Stagg Bowl since 1993, will be looking for its 12th championship. St. Thomas, in its second, will be looking for its first … in football. The Tommies have won 15 championships in other sports. These teams met in the 2012 Stagg Bowl, the only one since 2005 not to feature a Mount Union/UW-Whitewater clash. The Purple Raiders prevailed, 28-10. Twelve St. Thomas players, freshmen on that day, could go out as champions by avenging that loss. Coach Glenn Caruso could complete a leap for a program that was ranked 206th when he took over. Mount Union coach Vince Kehres has won championships as a player and assistant coach, but is 0 for 2 as a head coach. Purple Raiders quarterback Taurice Scott has played in a Stagg Bowl, even scored a touchdown, but has never been the starting quarterback. The reasons to be intrigued are many, but the best one is that we’ll probably have a competitive game. Both purple-wearing teams have dominated all season, up to and through the semifinals. Each team beat another top-five team by at least three scores in the semis. So how the heck should you know who’ll win? Enter the trusty Triple Take panel, expanded to include almost all of the D3football.com staff in Salem this week, plus a few guest prognosticators who cover each Stagg Bowl participant closely. Below, we each take our best guesses at who’ll win and why. Nobody consulted with one another. 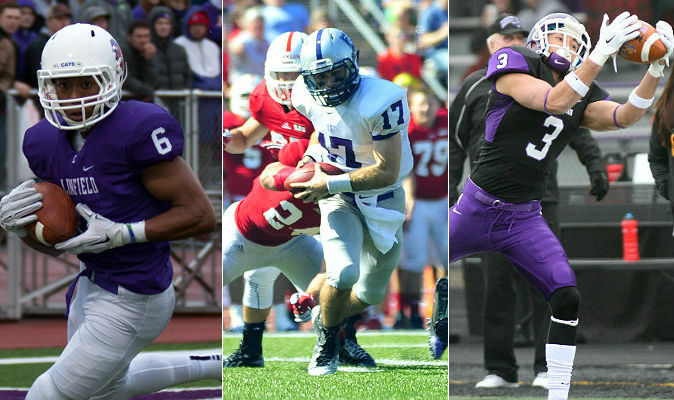 Last season, our panel split, 4-3, for UW-Whitewater, and we’ve taken a stab at predicting the winner in every Stagg Bowl since 1999. Feel free to add your pick and reasoning in the comments section below. And thanks to Clark Ruhland, who created the graphic above for the City of Salem. I’ve spent a lot of time thinking about various ways this game might go down, and I can definitely see some ways in which St. Thomas can win. They could pound the rock, control the clock, get an occasional stop and maybe a big special teams play and win that way. Or their defense could be so good that Mount Union finds itself stymied in both phases of the offense and can only break through occasionally. Taurice Scott is very much like Augsburg quarterback Ayrton Scott — so much so that the two were both considered very closely for All-America status. But while they are both similarly talented, the Scott wearing purple is probably a better decision maker. And it helps when your offensive line gives you a little more time to make those decisions. That’s where Mount has the advantage — a playmaking quarterback and playmaking wide receiver. Meanwhile, I’ll be watching the play along the lines as much as possible — do Jordan Roberts and Jack Kaiser get the room they need to run? Can the line hold off Tom Lally, Mike Furda and the rest long enough to make longer routes happen? (And then will Jack Gilliland hang onto the ball if he gets it on one of those routes?) In the end, I see the Mount Union passing game as enough of an advantage to overcome St. Thomas’ ball control and special teams advantage. And if I knew who had the advantage on defense, I’d be really good at this. Mount Union’s got the name and the pedigree, but St. Thomas certainly has a chance on Friday night, and it starts up front. If the Tommies’ dominant O-line can push around Tom Lally, Mike Furda, Hank Spencer and company, the national championship trophy is going back to Minnesota. If not, it isn’t. The matchup between the Tommies’ blockers and Mount Union’s front six is one of two deciding factors. The other will be how Mount Union wide receiver Roman Namdar matches up with Mozus Ikuenobe and Jordan Young, the Tommies’ two corners, who can match the size of the Purple Raiders’ star wide receiver. Can they match the speed? In the end, Mount Union has a pretty good offensive line of its own, and an outstanding quarterback in Taurice Scott, so that’s where my pick lands. But I really think whoever controls the line of scrimmage when the Tommies have the ball wins the game. Coach Vince Kehres was clear after last weekend’s game that the Purple Raiders know their job isn’t done. It was a great feeling to beat UW-Whitewater so thoroughly, but in the end, it was just the penultimate step to the Walnut and Bronze. Friday in Salem is the day that matters most. Mount Union is as complete and dominating as it has ever been. Mount’s offensive and defensive lines made certain to purge the past story lines about them getting beaten in the trenches. As strong and agile as Tom Lally and Durum Alarms and others are on defense, and as foundationally sound as Mitch Doraty and the rest of the O-line is, I don’t see this crew giving an inch, let alone a mile. The Purple Raiders have a nimble quarterback and workhorse rusher to channel the best traits of teams from years gone by. All this is not to say that St. Thomas is going to get steam-rolled or to have no shot. The Tommies are adept at wearing down their opponents and making big dogs look like puppies. Jordan Roberts is unquestionably an All-American-caliber back who will test Mount’s defense unlike anyone else this season. Focus too much on him, though, and UST’s passing game will light up. The Tommies have been noted this season as being a team without massive individual star power. Rather, they’re a “team” in every great sense of the word — units working as one on both sides of the ball, moving together and winning together. We will see a better matchup between these teams than we did in 2012, and one of these two head coaches, Kehres or Glenn Caruso, will get their first Stagg Bowl victory at the helm of their team. I think we can all agree that these are undoubtedly the top two teams in the nation. The number one offense and defense pitted against the second-ranked offense and defense. These teams have mirrored one another all season. Both have overpowering offensive lines keying power rushing attacks. Both have talented, physical cornerbacks who can man up and allow the front six/seven to play aggressive defense. Both have seniors who stepped into starting quarterback roles for the first time and have done much more than hand the ball off. Both teams have balance. The question we’ll need answered is which team has a weakness, and which team will expose the other’s weakness first? The matchup I’m most interested to see comes when the Tommies have the ball. Mount Union cornerback Tre Jones can take away a team’s best receiver, as he did against UW-W’s Marcus Hudson last week. But will he match up with the Tommies’ best receiver, who happens to be tight end Charlie Dowdle? Will the front led by Tom Lally, Mike Furda, and Durum Alarms, be able to pressure John Gould into forcing some poor decisions, or will David Simmet and company give him plenty of time as they have done all season (15 sacks allowed in 14 games)? I can’t imagine Mount Union losing three straight Stagg Bowls, especially as good as they looked last week against UW-W. But this appears to be the kind of special St. Thomas team that is capable of taking the program to unprecedented heights. This should be a Stagg Bowl for the ages. There are two key questions to look at when examining this game. First, will Mount Union come out flat after beating the school the Purple Raiders faced in umpteen Stagg Bowls? 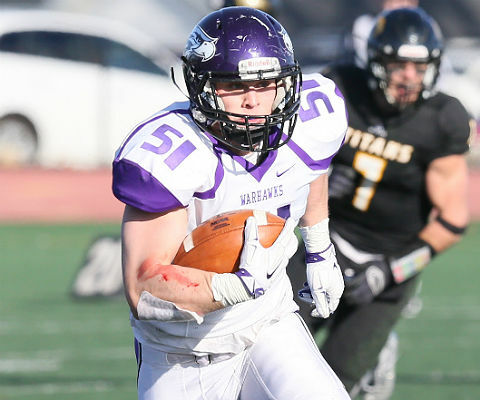 Second, who will win the war in the trenches that has really been the key reason Wisconsin-Whitewater won recent Stagg Bowls against Mount Union — Kevin Burke was constantly on the run the past two years, throwing off Mount Union’s offensive rhythm? I think St. Thomas possesses a small edge in the answers to both of these questions, enough to make this a very close and exciting game. I’ll say that the Tommies upset the 4 1/2-point favorite Purple Raiders. The rematch from the 2012 Stagg Bowl will be a great battle between what seems to be the two best teams in the country. Both teams have been able to roll through all their opponents throughout the year for 14-0 records. It will be interesting to see how each team will adapt assuming it will be a close game that will require a full four quarters. At the end of the day, the game will be won and lost in the trenches. It will be UST’s big offensive line vs. a dynamic Mount Union front six as well as the blitzing Tommie defense against an athletic Purple Raider offensive line. I think UST’s run game with a healthy Jordan Roberts will be able wear down the Mount Union defense throughout the game and the Tommies will be able to efficiently throw the football when they need to. It will be a defensive struggle throughout the game with special teams and field position being key, but the Tommies win their first Stagg Bowl. One of the biggest questions Mount Union’s players/coaches have been asked over the past week is will there be a letdown against St. Thomas? Head coach Vince Kehres emphatically says no. “This is Week 15, there’s no letdown at this point” has been his typical reply. For the Purple Raiders, their season isn’t defined by any single victory regardless of if the opponent is Baldwin Wallace or UW-Whitewater, it’s about that week’s challenge. This year’s senior class was part of the 2012 national championship team and a handful of them played in that Stagg Bowl. 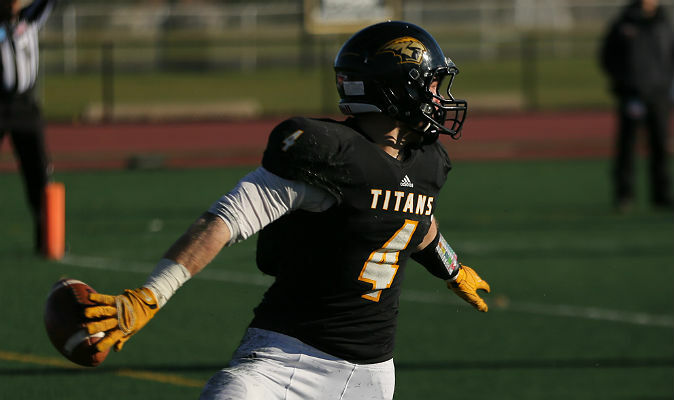 But all-American safety Alex Kocheff said it best when he said that while he started and played the whole game four years ago against St. Thomas, he felt it was the seniors’ moment. Four years later, Kocheff and the other Purple Raiders have a shot for their moment. Everything they’ve worked on the past three years under Kehres can be rewarded with a national championship. Make no mistake about it, St. Thomas provides a formidable test with their offensive line and running attack. Their special teams trickery has also helped them get to this point. Both those have also been strengths for Mount Union too. Under Kehres, the Purple Raiders have executed two fake punts, a fake field goal and two fake PATs. Much like 2012, there’s just a feeling that it’s Mount Union’s year and their experience — three players will be playing in their 60th game — is an hard factor to overlook. No. 12 comes back to Alliance. Even though it’s a rematch of the 2012 Stagg Bowl, the game feels fresh. And to be honest, I love this matchup and you should too. St. Thomas represents hope for the rest of D-III when you consider eight years ago, this program was coming off a 2-8 season. Then it hired Glenn Caruso, and into the 2015 Stagg Bowl it brings the nation’s second-ranked scoring offense and second-ranked scoring defense while having punted only 12 times in the first 10 games. But guess who has the first-ranked scoring offense and scoring defense? Yep. That ole blue blood, Mount Union on the other sideline. There’s plenty of intrigue as there is a contrast in offensive and defensive styles. Will St. Thomas be able to take that offensive line, which averages 6-foot-4, 310 pounds, and run the ball down Mount Union’s throat? How do they match up with a defense which has one player at each level of the defense, who is making his 60th start (Tom Lally, Jonathan Gonell and Alex Kocheff). A fast defense, which Caruso has gone on record saying is part of the fastest team they’ve faced this season. Is Jordan Roberts healthy enough to slam the ball on those off tackle power plays? The concern is if they can’t run the ball on Mount Union, this is an offense where John Gould is only 29 for 53 with two TDs and two INTs in his past three games, which came against the best teams St. Thomas has faced all season. Yes, they didn’t need him to throw with Roberts and Jack Kaiser following that line. Yes, they dominated the best teams they’ve faced. And as a result, Nick Waldvogel only has 15 catches in the last three games while Dowdle only has seven. Are they using a Larry Kehres/Greg Micheli trick here, where they don’t want their passing game on film? We’ll find out Friday night. Meanwhile, the other half of the matchup is a big-play, quick strike Mount Union offense triggered by Taurice Scott, versus an aggressive, stack the box St. Thomas defense. Scott has been sensational during the playoffs while Roman Namdar and Tim Kennedy have been on the receiving end of some big plays. And they run it pretty well, too, with Logan Nemeth. St. Thomas will load the box to stop the run and try to put stress on the Mount Union offensive line charged with protecting Scott. The St. Thomas corners have played well thus far, but that defensive front seven can’t get home every time. I feel like Caruso will try some kind of trickeration Friday night.The Tommies are 26-2 when they score via an interception, blocked punt, or punt/kick return. I’m rambling because I’m going back and forth on how this game will go. St. Thomas is 15-5 under Caruso in the playoffs – but 14 of those wins came at home. I don’t think the front seven of St. Thomas will get home every time and as a result, Mount Union will score points early. I don’t believe UST is positioned at this point in the season to win a game via the air. Mount Union already faced down one of its demons last weekend and shut down the Whitewater offense, holding them to six points — and that HAS to count for something. Too many little nagging questions for St. Thomas while Mount Union already faced down an opponent in Whitewater, who is stylistically similar to St. Thomas. In the end, I like the explosiveness of the Mount Union offense and their elite defense a little better than I do the other Purple Power lining up across from them. We invite you to add your predictions in the comments below, or tweet at us (names above are linked). Download the season’s final Around the Nation podcast, recorded from the press box in Salem, wrapping up the season following the Stagg Bowl and announcing the players and coach of the year. We often use the phrase “Purple Powers” to refer to Mount Union and UW-Whitewater, since they’ve faced off in all but one Stagg Bowl since 2005, with the Warhawks winning six. In 2012, Mount Union beat St. Thomas. The last team besides those three to win in Salem? That would be Linfield, in 2004, which beat another purple-clad team, Mary-Hardin Baylor, both on that day and in this year’s quarterfinals. So we’re comfortable calling this year’s four semifinalists, Mount Union, UW-Whitewater, St. Thomas and Linfield, purple powers in their own rights. We can honestly envision any of these teams losing on Saturday, or winning it all. So whatever Division III lacks in final four variety, it makes up for with competitive intrigue. Of the 28 playoff games so far, our panelists have picked all but two (Keith), three (Pat) or four (Ryan) winners correctly, but we might not guess correctly again. We’ll take stabs at it anyway, because readers appreciate it so much. If I had to characterize this week simply, it would be the brutes (St. Thomas and UW-Whitewater) against the fancy pantses (Linfield and Mount Union). Of course the Wildcats and Purple Raiders are strong and gritty too, and the Tommies and Warhawks have playmakers capable of dazzling, but you’ll see speed and ability to get up the field more from Mount Union and Linfield. St. Thomas and UW-Whitewater would be fine lining up and mauling their opponents. 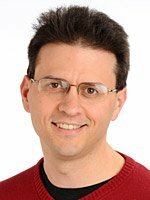 Around the Nation columnist Ryan Tipps, editor and publisher Pat Coleman and I will go into further detail with our picks below. Disagree? Then please add your picks and insights in the comments section. On Monday’s podcast, Pat and I will revisit the weekend and preview the national championship game. This time last week, I don’t think you could have convinced me to pick the Warhawks over the Purple Raiders. Oh sure, beating playoff-caliber teams 51-7 and 66-7 doesn’t give any clue to how they’ll fare against UW-Whitewater (the Purple Raiders are 3-6, and 0-2 under Vince Kehres). But Mount Union had a dominant defense, a very competent offense and had been my No. 1-ranked team since October. UW-Whitewater had been good, but didn’t have that “it” that their previous championship teams have had, be it at quarterback, in the secondary, down the middle of the defense, at offensive skill positions or on the coaching staff. But in the second half last week against UW-Oshkosh, possibly the best D-III team not still playing this week, I caught a glimpse of “it.” The Warhawks’ offensive line — From left, Jordan Mueller, Mitchell Schauer, Spencer Shier, Austin Jones and Tony Koepnick — were again moving as one on run plays, and providing all the time in the world on pass plays. That’s a problem for Mount Union, because the best part of the defense might be the line, led by Tom Lally and Mike Furda. If the UW-Whitewater offensive line can keep those guys and Mike Vidal and Elijah Berry off Chris Nelson, the Warhawks quarterback will find Marcus Hudson and Joe Worth for big plays, and Jordan Ratliffe will be able to run. Mount Union coach Vince Kehres came through the ranks as a defensive player and coordinator, so there’s no outsmarting him, or a defense anchored on the back end by Gagliardi Trophy final-10 safety Alex Kocheff. But the Warhawks don’t really win by outsmarting teams, they win by wearing them down. I see Mount Union scoring some points, and being in the game late. But if the Warhawks have the ball late in a close game, Mount Union will have to prove why we should expect something different. There have been some epic semifinals in Alliance, and this one might join the ranks. The question is whether the home fans will leave happy, or with a sixth loss to UW-Whitewater in the past six meetings and without a trip to Salem for the first time since 2004. Not only is this regular matchup not happening in Salem, but I also think that Whitewater will prevent a rematch of the 2012 UMU/UST Stagg Bowl. The Warhawks won me over last week by avenging the regular-season loss to Oshkosh. UW-W has felt the pressure of playing a team close into the third quarter and knows what it takes to end the game with a win. Mount Union hasn’t been in that situation this season, jumping out to early leads and making them stick for the full 60 minutes. There are playmakers all over the field, on both teams and both sides of the ball, and that will make for some really exciting and memorable moments in this matchup — and it will help to keep this game close for much of the time. Ultimately, as in years past, it comes down to me liking the front lines of the Warhawks better than those of the Purple Raiders, and many Stagg Bowls in the past decade have been won in the trenches. We’re in uncharted waters here, with these two teams meeting on Mount Union’s home field, and in my analysis, I’m putting this on the edge on the sidelines, for Mount Union. In previous meetings, I think UWW has had the coaching advantage but with all the changes on that sideline, I have to give Mount Union the benefit of my doubt. Meanwhile, I think these teams are pretty evenly matched. The key matchup, as with every Whitewater-Mount Union game (and probably every Purple Power game) is along the front lines, and I’ll be interested to see how the Purple Raiders, with a few more seniors up front, attack the Warhawks’ offensive line. Jordan Ratliffe has been worked a lot lately and although he seemed not to really feel the 38 carries he got vs. Wheaton, at some point that begins to have an impact. But the other matchup I’m most keyed on is the Whitewater secondary vs. the Mount Union passing game. This is a big test for the Purple Raiders, who haven’t really faced this level of competition this season. The thing I like most about this game, however, is we can focus on the football, and so can the teams. There’s no constant ESPN presence at this game, no banquets, no local community service, just line ’em up and go. Outside of Minnesota, Wisconsin and Ohio, Linfield is probably the sentimental favorite. Let’s start there. After a string of playoff heartbreak, against UW-Whitewater (2009 semifinals), St. Thomas (2010 second round, in overtime), Wesley (2011 second round), UW-Oshkosh (2012 quarterfinals, in overtime) and UW-Whitewater twice more (2013 quarters and 2014 semis), it would be natural to for a neutral fan to pull for a Linfield breakthrough. Then when you add in that they’re still hoisting after games the framed jersey of Parker Moore, the player who was killed near campus in 2014, recently had their play-by-play voice pass away and had a backup quarterback pass for 492 yards in coming from 21 points behind, how could you not pull for the Wildcats? From the Catdome Alumni videos to Coach Joe Smith’s mustache to the comeback last week against UMHB, it just looks like a fun program that represents the spirit of Division III. But, these choices are made with the head, not with the heart (Besides, Glenn Caruso and St. Thomas are fun and equally spirited). I’m drawn to something Wabash coach Erik Raeburn said after last week’s quarterfinal loss to the Tommies; that St. Thomas was able to stack as many as nine in the box because the cornerbacks were taking away the outside receivers. If you listened to our podcast this week, you’d have learned that St. Thomas sacrifices some size for speed on defense, and that Linfield’s wide receivers have gone unheralded much of the season, though they had a huge game against UMHB last week. If the matchup favors the corners again, the Tommies are fairly open about their plan to stop Spencer Payne and the rushing attack, then get after the Linfield quarterback. And frankly, it doesn’t matter to me which one it is, since in six-plus quarters of Tom Knecht, Linfield hasn’t slowed down from Sam Riddle’s pace. I don’t care about Linfield being on the road either; an elite team can win on any field. But between the secondary/wide receiver matchup, and the fact that 6-foot-9, 350-pound tackle David Simmet will likely be blocking Linfield’s best defensive player, Alex Hoff (unless, of course, Jackson Vaughan moves Hoff around), the matchups seem to favor the Tommies. One more ring of the victory bell is possible. We’re at the point in the season where every team has weapons on both offense and defense, every team is tested against good competition, and every team has a legitimate shot at making it to Salem — and winning it all. And those facts make it difficult to create separation between these Linfield and St. Thomas. As with last week, the health of Linfield quarterback Sam Riddle is crucial. With him, I would give the Wildcats the nod in this game. Without him, well… I was pleased to see how well Tom Knecht stepped up against Mary Hardin-Baylor last week, especially in the second half. But I think the team needs Riddle at 100 percent in order to advance. There’s just no margin for error at this level of the game. Both defenses should stand tall this weekend, and it would be no surprise to see those units contributing to the scoreboard. Linfield will also be hurt by UST’s ability to take away the run game and force the Wildcats to throw the ball. Pinning Linfield into one-dimensional play will help the Tommies come out on top. We’ve seen St. Thomas dismantle basically everyone this year, including some pretty good teams. And I’ve seen a couple of those games in person, along with having seen Linfield in-person once. I’m savvy enough to understand that Linfield having or not having quarterback Sam Riddle is not the only factor to this game, nor is any possible limitation to St. Thomas running back Jordan Roberts. Similar to what I said about the UWW-Mount Union game, the lines and that battle up front will be a huge factor here. St. Thomas’ secondary will get a test this week, similar to what it saw at the end of the regular season with Gustavus Adolphus. Even though the Gusties were just 7-3 overall, they had a national-level passing attack and the Tommies held them more than a hundred yards below their average. So Linfield is the best passing attack St. Thomas has seen and St. Thomas is the best rushing attack Linfield has faced. I’m meandering around this because in the end, I’m picking against the team that’s No. 1 in my poll. We invite you to add your predictions in the comments below, along with our own Adam Turer, or tweet at us at @D3Keith, @NewsTipps and @d3football. Download the Around the Nation podcast on Mondays, where Pat and Keith review the picks and the highlights from the semifinal round. Wesley will bring some offense to Alliance. Will that be enough? So let’s make something clear from jump. Give or take a Hardin-Simmons, Wheaton, St. John’s or Johns Hopkins, we’re down to the eight best teams in the country. They’re all elite, and it’s hard to find fault with any of them. But only four will advance, and as your trusty Triple Take panel, we’ve got to choose between the best of the best. If Round 1 games were speed bumps on the “road” to Salem, and Round 2 was, say, a DUI checkpoint, the quarterfinals are like driving through Snoqualmie Pass in winter. This round is exponentially more difficult to get through than the last. What we love about it is that the eight programs in it are historically successful, but also pretty loaded this year. Gone should be the 49-0 and 55-23 scores of the early rounds, although as you’ll see, we’re not expecting every game to come down to the final possession. This is no longer a matter of want-to. Each of the eight teams dreams of being the group in Salem hoisting the walnut and bronze trophy; only one will finish the job. This is when history is made, and for the rest of us, hot diggity … we get to kick back and watch. Around the Nation columnist Ryan Tipps, editor and publisher Pat Coleman and I make our picks below. Please add your picks and insights in the comments section. On Monday’s podcast, Pat and I will revisit the weekend, including the surprise winners and those who stood out. In an era of four wides and run-pass option plays, the Tommies and Little Giants present a stylistic slugfest. Sure, they’ll give multiple formations and run misdirection plays too, but each has a foundation built around a bruising running back and his line, and a suffocating defense. The issues I forsee for Wabash, though, are twofold. One is slow starts; It’s cool to say you always fight, but maybe start punching in the first round. The Little Giants trailed Albion, 14-6, and Thomas More, 27-13, in the third quarters of their first two playoff wins. Wabash doesn’t need me to tell it that it can’t count on coming from behind this week, not against a St. Thomas defense who let a team cross the 14-point barrier for the first time last week in a 38-19 win over St. John’s. It doesn’t need me to point out that the Tommies (plus-9 in turnover margin) have only 17 giveaways in 12 games, and six turnovers won’t fly this week. The second issue is sheer size. The Tommies average 306 pounds across the offensive line, with 6-foot, 222-pound Jordan Roberts carrying the rock behind it. That’s almost the exact size at which Wabash RB Mason Zurek is listed, and his line averages a not-too-shabby 283. So if Wabash can go blow-for-blow and keep alive a chance for another Always-Fights finish, I hope its junior linebacker Connor Ludwig who makes the play. Ethan Buresh scooped-and-scored his way into Division III lore with the game-ending runback at the end of the Thomas More overtime, but if you watch the Play of the Week closely, Ludwig could have snagged it and been the hero. Unselfishly, he let Buresh scoop it and led the convoy, in a true team-player moment. I started the season with the Little Giants ranked No. 9 on my Top 25 ballot; St. Thomas was No. 17. Notable in those positions isn’t just how much better St. Thomas has turned out to be but also the fact that that is easily the highest I’ve ever positioned Wabash in the preseason. I even noted in the surprises/disappointments Around the Nation column a couple of weeks ago that in 20 years of watching Wabash play, this group is special — the determination, the aggressive defense, the potent offensive balance. Even early on, it all pointed to a season to get the LGs to where they are now. The question is whether it can get them even further, and that’s where I’m wavering. By my definition, this Wabash group is elite, joined by many of the others in the Top 10. St. Thomas, on paper (big and heavy paper, that is) is better. Wabash plays a lot like Linfield does, with speed and finesse that compensates for any size deficiencies. St. Thomas seems to not only have the size, but I believe the Tommies also carry it well, which shows in the explosiveness of the offense. UST could be a Stagg Bowl-worthy team, and I do feel they will have to work for that possibility this weekend. These are two very similar teams. St. Thomas larger. Faster? No idea, hard to tell on tape. Better tested? Probably in the regular season, maybe not in the postseason. As expected for this time of year, each team is coming off the game in which it gave up the most points and had the closest game it had all season. A lot has been asked of the primary running back for each team lately, with St. Thomas’ Jordan Roberts going for 30-plus carries four times in the past six weeks. And the past two weeks he hasn’t even managed four yards per carry, so that’s something to keep an eye on. Mason Zurek is coming off back-to-back-to-back weeks of 37, 39 and 35 and while he didn’t have the nine yards per carry last week he did in his two prior games, he did still manage 5.2 yards per carry. Line play will be huge, to be sure. Weather should not be an issue, in fact, it looks like the best possible Dec. 5 we could possibly have in St. Paul. No reason not to expect another close games: Tommies, fans, be sure not to squint out there and mistake the Little Giants for the Johnnies. I expect a one-score game. I have to stick with my pick from Surprises and Disappointments, and the injuries for Linfield keep me from feeling like I’m taking a total shot in the dark. I’ve previously laid out the case for symmetry; last year I couldn’t have been more convinced that UMHB was the better team, with it hosting and Linfield having a regular-season loss, and the Wildcats went to Belton and pulled the upset. So this year, Linfield is unbeaten and hosting, and UMHB is the one with the loss and the spottier playoff games to date. You can see UMHB struggle a bit for yourself, since the Huntingdon Stretch Internet portal has the game available on demand still. So you might also be able to see the ridiculous athleticism of its defensive line, or that the Cru, long known for its commitment to the run, makes better use of its wide receiver talent. The Cru also stopped flip-flopping quarterbacks and let Zach Anderson handle almost all of the work last week, and the senior passed for 293 yards. UMHB, which generated a very good 35 turnovers this season, is the kind of team who could get blown out at Linfield, or could hang close for a while and then get so hot for a quarter or two that they pull the upset. Linfield’s got a history of failing in big games when the team had Stagg Bowl talent, and keeping alive a potential matchup of the only purple powers we have yet to see face off, Linfield and Mount Union, would be a treat for D-III fans. The Wildcats are also accustomed to overcoming adversity, and with a QB injury and the death of broadcaster Bill Johnson this week, they’re doing that again. I foresee a shootout worthy of these two teams’ storied histories, but I’ve been way wrong before. The starter or the backup, that is the riddle … With quarterback Sam Riddle in the game, I wouldn’t have hesitated to pull the trigger on Linfield. However, I don’t know the status of his injury, which left him on crutches for a time last week. Tom Knecht is a highly capable backup who would be the clear starter at many other schools, so the Wildcats won’t see a detrimental drop in their offensive momentum. But the challenge is bigger now than it otherwise would have been. I didn’t have to read the Road to Salem feature this week to know that UMHB is out to avenge last year’s loss. In fact, Linfield is one of the few teams that have ever beaten the Cru in the postseason, so there are unique undertones to this game. Both teams are their dominant selves on both sides of the ball, so I wouldn’t be surprised to see something like a turnover or a special teams play to really break this one open. People close to the Wolverines program don’t believe this defense is as good as last season’s, and that one gave up 70 at Mount Union in the semifinals. 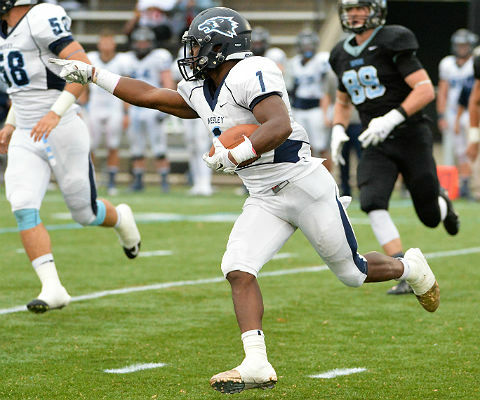 The chance for Wesley is that Joe Callahan has a game in Alliance more like the 633-yard one from 2013, and with James Okike (and Alex Kemp, Bryce Shade, Jamar Baynard, Kyle George et. al.) on the other end, it’s possible. Only two teams have managed to keep the Wolverines’ offense in the 30s this season, but the Purple Raiders have the nation’s best defense. Mount Union’s offense doesn’t have all-everything QB Kevin Burke this time around, and they haven’t played anyone who’s been as successful as the Wolverines. Still, it would take an uncharacteristically mistake-free game from Wesley to get it done, since Mount Union is plus-17 in turnovers with only six giveaways this season. The Wolverines are plus-three, and Callahan had three giveaways in the first half last week. Mount Union has a relentless defensive line, and Wesley will counter that by having Callahan get rid of the ball quickly and creatively. But even if all goes well on offense, it goes back to how I led this pick off. Wesley is going to have to play a great game defensively as well, and that might be where it ends up overmatched. I saw the meeting between these two teams last fall, and while I know that each season is unique, it’s hard to unsee something like that. Week after week, Mount has rolled through its games and looks no less awesome than it has for the past umpteen years. Wesley, on the other hand, has had me on edge a few times, letting opponents find the end zone a few too many times this season. I don’t think the Wolverines are as polished as in some of the more recent seasons. Mount Union is stacked with playmakers, particularly on defense: Jones, Kocheff, Spencer, Furda, just to name a few. These guys were studs last year and the year prior, and now they’re hardened seniors who won’t be having any of what Callahan & Co. are dishing out. Wesley has played Mount Union well twice. I don’t expect this to be the third one. The Wolverines will score points — I know the number I’ve predicted above is more than the Purple Raiders have given up in any game this year and that’s not an accident. And they won’t all come after Mount Union goes up 56-0, unlike last year where Mount Union scored the first 70 and Wesley scored the last 21. Joe Callahan and Co. will get some points. It just won’t be nearly enough, not even enough to push the Mount Union defense or even make it necessary for the starters to play the whole game. Meanwhile, Mount Union should be able to score at will considering that Wesley has allowed other teams to put up points as well. This pick gives me plenty of pause, because the Titans have allowed only seven points in the past three games, and because it seems to have the makings of a special offense as well. But I’m also wary of reading too much into the 10-7 mid-October win, where some unlikely-to-be-replicated occurrences helped the Titans beats the Warhawks. UW-Oshkosh fumbled five times in that game and recovered them all. The Titans blocked a 44-yard field goal attempt with 1:59 left. They also limited UW-Whitewater to a not-fluky 76 rushing yards on 32 carries. Look, I get that these teams have grown since then, and no rematch would be played with the same strategy as the first. But I can’t shake the feeling that but for a few plays, we’d all still see UW-Whitewater as the No. 1-ranked defending champion. The home-field advantage here is negligble, as is the element of surprise, which can be a big deal in the postseason. UW-Whitewater seems to have gotten its offense on track since that midseason game, with QB Chris Nelson being efficient and RB Jordan Ratliffe carrying 38 times in last week’s win at Wheaton. So I’ll go with the champs, who have been tested on the road, have the big-game experience and have the confidence, until someone knocks them off when it counts. Considering that this is the one game of the bunch in which the teams have actually already played each other this season, it’s surprisingly hard to peg how this one will turn out. I was slow to get on the Oshkosh wagon, but I’m now firmly buckled in for a ride that could last a couple of more weeks. We’ll certainly see the intensity we saw the first time around, but I don’t think we’ll see the same kind of defensive battle as then. There will be touchdowns (yes, plural) by each team, but there will also be reason to tune into this game online. Whitewater has found its footing the last several weeks and seems to consistently be the kind of team that toppled Morningside earlier this year (Morningside ended the regular season No. 1 in the NAIA). It’s almost startling to think about Whitewater bowing out of the playoffs this early, but that’s what will happen after lining up again against the Titans.